The Titanic crew visited Liberty Steel for a guided tour of the plant and to learn how slabs of steel are rolled and shaped into plates for ships, bridges and rigs. As a result of changes to SQA exams, staff at Our Lady’s High School, Motherwell, spotted an opportunity to provide an exciting programme of interdisciplinary experiences for some of our National 4 students. 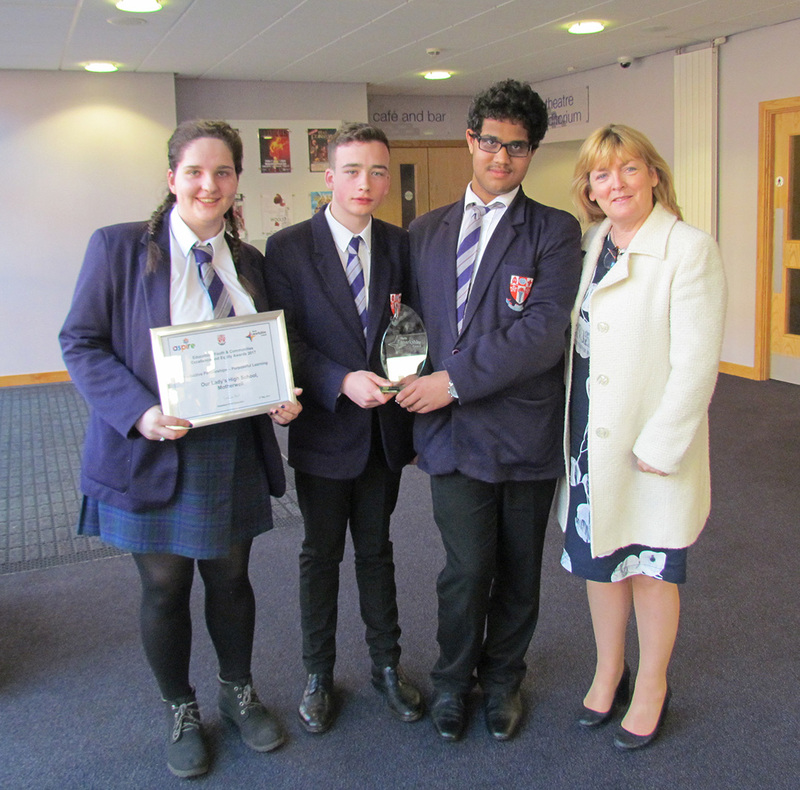 Our aim was to help pupils gain additional qualifications while expanding their life experiences and raising awareness of the options available to them on leaving school, all through focusing on the Titanic disaster. We are now approaching the third year of this vibrant project which runs over three weeks of the SQA diet. The programme coordinators are PT Pupil Support, Lyn Zambonini, and Library Resource Centre Manager, Jennifer Macfadyen and involves staff from across Our Lady’s High School, local businesses, voluntary groups and national organisations. Following an initial introduction, the programme is split into four broad areas: ship building and design; life aboard the Titanic; the disaster itself; and the rediscovery of the wreck. We were stunned to discover that the steel plates that built Titanic had actually come from the Colville Steelworks in Motherwell, making a wonderful connection with our local heritage. Pupils were lucky to experience Tata, now Liberty Steel, in the process of rolling the steel plates with a guided tour by staff at the plant, who also provided pupils with many stories of life at the steelworks and a thorough grounding in Health and Safety routines. Although the Titanic was built in Belfast, we were able to take advantage of the Clyde’s vast experiences in ship-building, visiting the Titan Crane at Clydebank, and the Denny Tank Museum at Dumbarton. Titan staff explained how riveting gangs worked, how the shipyards were a part of the community and how dangerous life was while the Denny Flotation Tank demonstrated the engineering expertise involved in designing and testing ships’ hulls. The group also discovered that Denny’s was even involved in testing some of Titanic’s lifeboats. This information became invaluable when learning about buoyancy with Science teachers back at OLHS, and designing their own hulls. Pupils also learned more about some of the passengers and crew aboard and the different lives they led on a luxury liner depending on their class. English showed the films, A Night to Remember and Titanic, and compared the special effects and reliability of each. Our group were able to put their new-found knowledge into practice by working with Lifestyle Development staff to create a shipboard lunch for staff – although staff did not know until the last minute whether they would receive the 1st, 2nd or 3rd class treatment and dining experience. To bring everything up to date we contacted Greenock Ocean Terminal who kindly arranged for us to have a tour of the Caribbean Princess. We used this experience as a focus on careers, bringing along our Careers Advisor, Miss Ruth Robertson from SDS to provide detailed advice. Seeing aboard a real cruise ship gave pupils a whole new way of looking at the world, and the numerous careers open to them. They were also keen to compare the Caribbean Princess to what they had already learned about ship design. They were definitely impressed by the safety regulations and the numbers of lifeboats. Turning our attention to the disaster itself, Mr Walter Lee from the RNLI kindly came along to demonstrate what happened with the iceberg and graphically explain what would have happened to the Titanic’s passengers in the water, including the effects of hypothermia – he even brought along his own mini iceberg! Other activities have included creating a map of the world demonstrating the Titanic’s route (Social Subjects); printing and poster making (Art and Design); trying out Morse code (Science); an afternoon swimming courtesy of NL Leisure (Lifestyle Development); building their own model Titanic (Social Subjects / Art); discussion of moral issues relating to women and children first and the treatment of 3rd class passengers (RE); further moral issues relating to the wreck arose following a screening of Ghosts of the Abyss: should the Titanic be raised? Should material be removed? Should the ship be left to rust to nothing? (English); and multi-lingual newspaper front pages (Modern Languages). With so many stories being generated from the project, we wanted pupils to be able to record the aspects that were most important to them, from the ‘women and children first’ policy, to the lifeboats, to the role of the wireless operator, so we introduced the group to storyteller, Allison Galbraith, thanks to part-funding from the Scottish Book Trust. Allison demonstrated the art of storytelling, and guided the group through creating and recording their own stories, helping them to record their own voices for posterity. Allison started by introducing herself and just talking with the group, building pupils’ confidence in speaking before a stranger. As a result, although pupils were nervous about recording, they were keen to participate. Allison also demonstrated breathing exercises and vocal warm-ups before recording began, with further advice on presentation as we worked through the stories. Despite occasionally breaking into the giggles, every pupil managed to record their own work beautifully. Discussion with pupils led to an additional trip which saw us taking the ferry to Rothesay and the stunning Mount Stuart House. This mansion was completed in 1912, the same year as the Titanic disaster and thus pupils were not only able to experience actually travelling across water – a new experience for all of them – but to see luxurious interiors similar to those of the ship they’d been learning all about. The Titanic Project continues to develop with partnerships emerging as various individuals and groups express an interest in participating. In 2016, our pupils were even able to join with St Brendan’s Primary as part of their anniversary visit to Belfast to see the Titanic Museum for themselves. The Titanic Project has been a huge success over the last two years. We have seen the pupils blossom, gaining in confidence, pulling together as a team, and their ideas of what’s available to them in the future have expanded rapidly. Each year pupils have created an exhibition of their experiences which have been visited by classes from across OLHS and visitors to the school, leading to further discussions and expressions of interest. Last year all of the pupils involved achieved the SQA qualifications. “Local investigations” at SCQF level 4. The Project continues to explore new ground and build new partnerships. Staff coordinators continue to collect materials, ideas and contacts and we look forward to its continuing success long into the future. Our Lady’s pupils had the theatre all to themselves, with practical workshops on Lighting, Sound, Costume and Make Up. We worked in the theatre itself, in the studio, backstage and in the dressing rooms. We worked with theatre staff, designers and technical staff, and got the opportunity to use the theatre’s lighting and sound equipment. We looked at the different kinds of lanterns used in the theatre, and had the opportunity to explore their effect and to create some exciting lighting states. We designed costume and created our own Soundscape for a piece of text, selecting sound effects choosing appropriate music and creating sound to enhance the production. Using Make Up proved great fun, but we also learnt about how to create the effect which we sought, and got the chance to try out some of our ideas on one another! This was a great day, where pupils had the chance to use their imagination whilst learning about how to create some of the crucial backstage elements which go towards making a production so effective. The National 5 Drama Production Skills workshop helped prepare pupils for the forthcoming National 5 examination. It covered important elements of the course, and helped pupils to understand much more about the nature and effect of the creative choices which are made when creating a production. Thanks go to Cumbernauld Theatre, to the specialist staff who offered invaluable support, and to North Lanarkshire Council for supporting this excellent venture. Each article is based on the novel that the class are reading; Millions by Frank Cottrell Boyce for one class and Divided City by Theresa Breslin for the other. This is a complicated piece of work, demanding interesting information, copyright free images, hyperlinks to additional information, adding tags and categories to help searchers, and ensuring it looks good online. In addition, the blogs can’t be biased or plagiarise anyone else’s work. The first two classes have almost finished their blogs. In fact some are already online and can be read by clicking here, with more to follow soon. If you enjoy their work, please leave some feedback. 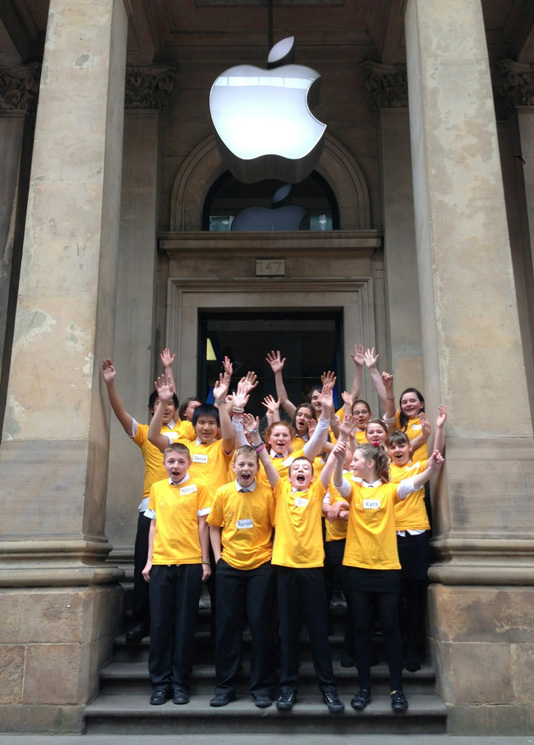 Miss McGinness, Mrs Maguire, Mrs Simpson and the S1 Literacy group visited the Apple Store last week to take part in a fieldtrip delivered by the Apple Store Specialists. During their visit the S1 students took part in an iPad workshop, learning how to become more confident in the use of various apps. They also created theme songs for their ‘Fairytales’ that they had written in school. The pupils and teachers had a fantastic time! Our interdisciplinary learning classes are now pulling together all of the different strands of their work in Art, Modern Languages, Social Subjects and the Library to create their bilingual comics about A Day in the Life of Stirling Castle. Pupils are using the photos taken at Stirling Castle, along with material created in Art classes and Social Subjects and the text from Modern Languages to tell their story using Comic Life software. The Council will be activating web authentication for the school’s ICT network on Wednesday 6th October. Web authentication has already been rolled out to almost half of North Lanarkshire High Schools and has been running for them for most of the year now. This means that pupils and staff will be asked to enter their file server usernames and passwords when they try to access most websites from this Wednesday.